"The coins in the 2008 United States Mint Presidential $1 Coin Proof Set are proof versions of the general circulating $1 coins scheduled for release, beginning with the James Monroe Presidential $1 Coin in February. These proof coins are struck multiple times with specially polished dies to create a brilliant, sharp relief and mirror-like background. Their frosted, sculpted foregrounds give them a special “cameo” effect. Each coin bears the “S” mint mark representing production at the United States Mint at San Francisco"
The sets may also be ordered by calling 1-800-USA-MINT (872-6468). Hearing- and speech-impaired customers with TTY equipment may call 1-888-321-MINT (6468). The presidential dollars are part of a multi-year program that was authorized by the Presidential $1 Coin Act of 2005 (Public Law 109-145) and features four new obverse designs annually. 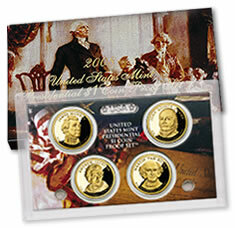 The 2008 release schedule for the circulating presidential $1 coins was announced late in 2007 – James Monroe on Feb. 14, John Quincy Adams on May 15, Andrew Jackson on Aug. 14, and Martin Van Buren on Nov. 13. Where can I purchase Andrew Jackson Historical Signature Set?